Bold blooms and pretty draped detail enliven this A.L.C. 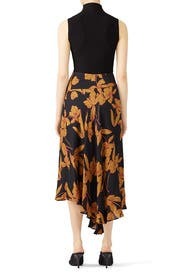 midi skirt that sways to and fro with every step. Black and tan printed silk (100% Silk). Skirt. Side zipper closure. 33" from waist to hemline. Imported. This skirt is gorgeous. I like skirts to hit me on my natural waist so I sized down and the 2 fit great. The length And print were good but not flattering on me. I love this skirt! It is silky and flowy and unique. I got so many compliments on it. It does run very big and is quite long. I needed to pull it up to my chest to keep it from touching the ground. This is a great skirt. Silk, so incredibly soft and comfortable. 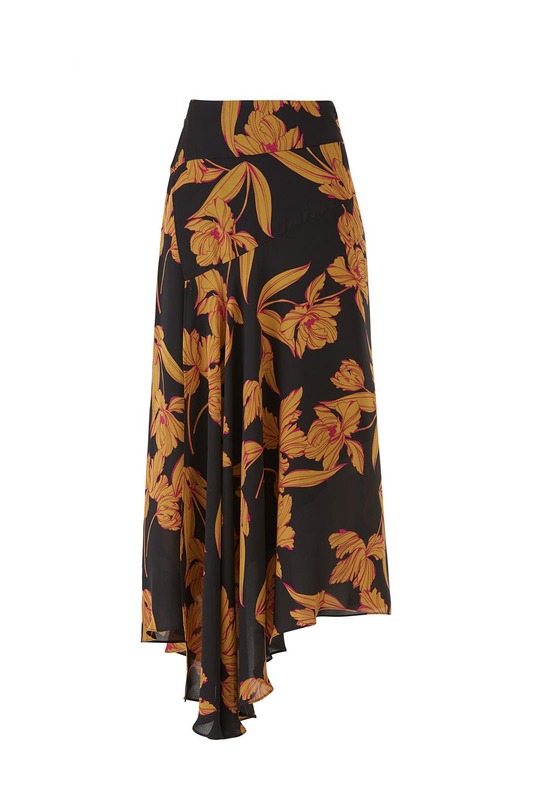 Colors, black, rust with a little bit of fuschia outlining the flowers on the skirt. Fit really well slightly on the loose side, which is only going to make me happy. Packed well, wrinkles fell out without ironing. I wore it with a rust silk skirt and a RTR Mother of Pearl jacket. Falls at the perfect length for mid leg boots. Be careful in windy situations, this is a wrap skirt, and while it does not blow all the way open, I needed to hold it closed in the Santa Ana winds. I really, really loved wearing this. Wore it to a dinner with friends. Beautiful skirt! Love the way it hangs and fits. Gorgeous for fall. Great fabric, appropriate for work or an evening out. Gorgeous but I choose a too small size. Better for warmer weather. Next time..
Slightly big in the waist - I would have ordered a 4 but it wasn't available. Overall still super cute and looked great with an oversized sweater and booties for the office. I wore this to work today and love it. I normally wear a 6 or 8 and got this in a 6. It sits high--at my natural waist. If your tummy is your trouble spot, it may make sense to size up. With Spanx on, the 6 fits fine on me. So pretty... I will probably wear this a few times before returning it. Unfortunately this wouldn't zip all the way up. Considering I'm more of a 16 this fit true to size. This skirt was so beautiful! I rented for a wedding but ended up keeping it for a while so I could wear it for a date night and thanksgiving. I received so many complements! The skirt fit very true to size on my natural waist. The patter was perfect for fall/winter. I did find the material a bit clingy and had to be very careful when I walked or took stairs to avoid an incident (thankfully I wore tights under). It is very flowy and comfortable. Co-workers and mom loved it. Wore it with a rust colored puff sleeve turtle neck. I had no cons. Love the colors and print, great style for fall/winter. However the skirt material is quite thin and it's only lined to mid-hip. The bottom of the skirt is actually two panels, unlined. the drapey detail in the front is where the panels overlap. Loved the colors, material, and style, but it ended up sitting lower on my hips than up on my natural waist. Size down. Beautiful skirt - the silk is so well made, worn this several times and love it. Loved this skirt! Very lightweight and pretty, fit well. 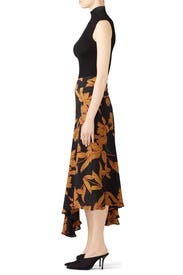 The way the skirt fits there ends up being a slit that opens in the wind. It's not a big slit and it still covers you fully, so it really bother me, but be careful if you wear it in a windy place or for a conservative event. 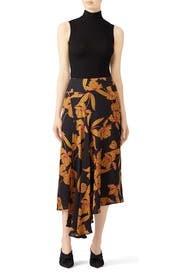 This is a flowy silk skirt that moves beautifully when I walk. The main color is black and the accent colors are mustard and purple. 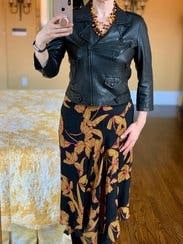 I wore it with a black leather jacket (RTR "Wes Moto Jacket" from Rebecca Minkoff), my own amber necklace (to pick up the mustard color in the skirt), and black ankle boots. The second time I wore it with a fitted black cardigan. This skirt runs true to size. 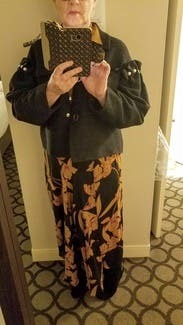 I am a size 8 at the waist & hips (5'8"; 155 lbs) and this skirt in size 8 fit perfectly. 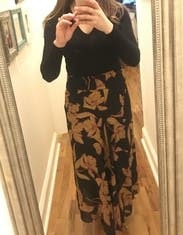 The only reasons I give this skirt 4 stars (instead of 5) is that the zipper on the left hip doesn't lay flat (despite ironing), which made me look wider at the hip than I am. Also, this skirt was really clinging to my legs (the dry winter air doesn't help). Loved! Great fit and cut. Instant sophistication. Wore in the winter with black tights, booties, a v neck sweater and leather jacket. Dress it up or down. It's super flattering. I would only recommend this skirt to a tall person, and if you are tall, do order it because it's absolutely stunning. Fits well but hangs a little strange in the front.